On a brisk October morning I woke up to the sound of the alarm clock at 6:00 a.m. sharp. In an hour I would be ready to lift off on a fun filled hot air balloon ride to a destination unknown. I had wanted to fly in a hot air balloon since my childhood days in Indiana where I would watch an occasional balloonist fly over my grandparent’s meadow. There was something magical about watching a colorful balloon drift by while I chased after it hoping the pilot would land near our home. 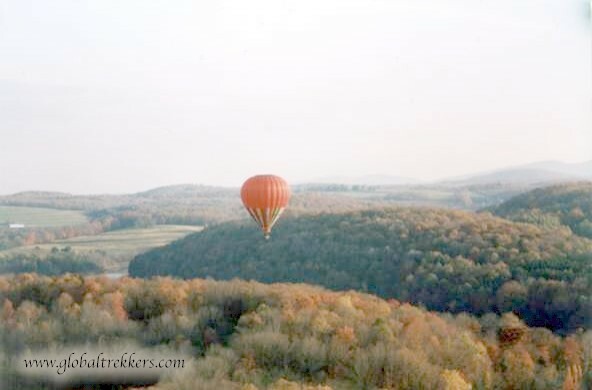 I could barely contain my excitement as I drove from my accommodations at the Red Barn Village Bed & Breakfast to Lackawanna State Park in northeastern Pennsylvania to meet the balloon crew. In the early morning twilight, the air was still and the dew was heavy on the grass. Take off is within one hour of sunrise or sunset when the air is the most calm. However, morning weather is much more predictable than afternoon weather. Morning flights are nearly always possible where evening flights are often difficult because the breeze can be quite strong and sometimes doesn’t drop until well after dark. Louis Minello, my pilot, welcomed me to the launch site and immediately recruited me to assist in the balloon set up. Within minutes, a second team, headed by Richard Powell, joined us and began setting up their balloon. Louis sent up a small helium balloon to see which way the wind would take us. We then proceeded to unroll the envelope of the balloon flat on the ground. The envelope is the colorful fabric portion that holds the hot air. The envelope was then attached to the gondola or wicker basket in which we would ride. The launch procedure begins with a cold inflation of the envelope. 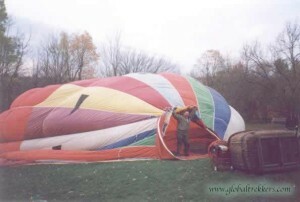 While the balloon is laid on its side, a large, powerful fan is placed at the opening. Once the balloon has been inflated with cold air, the pilot will begin to introduce hot air into the envelope. 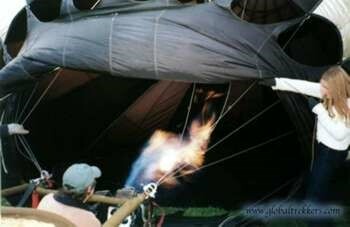 With the burner pointed towards the opening of the balloon, the air is heated just enough to lift the basked into a vertical position. We climbed into the basket and Louis fired the burners until we were weightless. The only thing holding us to the ground at that point was the ground crew as they clung onto the sides of the basket. The second balloon team was also ready to launch. As the ground crew released the basket, we gently lifted off and so began our flight. The sensation is not at all like flying. The balloon rises in a slow, steady ascent above treetops, being driven forward by a gentle breeze. Once a balloon is afloat, it moves in the same direction as the wind, no faster, no slower. There is virtually no sense of motion and the only noise you will hear is the whoosh of the burner. When the burner is turned off, there is nothing but silence. The pilot has complete control of the up-and-down movements by controlling the heat in the envelope. “It’s really quite simple,” Louis explained. “I turn up the flame and as the air inside the balloon is heated, the balloon rises. I turn the flame down and we hover awhile. Once the air in the balloon cools, we begin to descend.” As he spoke, I looked at the altimeter and saw that we had already climbed 500 feet. As we hung motionless over a reservoir, we had an unobstructed 360-degree view of spectacular scenery. Pennsylvania’s fiery October foliage, ablaze in colorful maple and oak, blanketed the hills around us. Off in the distance I caught a glimpse of Richard’s hot air balloon floating carelessly in the wind. We hovered awhile to allow them to catch up to us. Before long, they passed us and proceeded to show off a little. 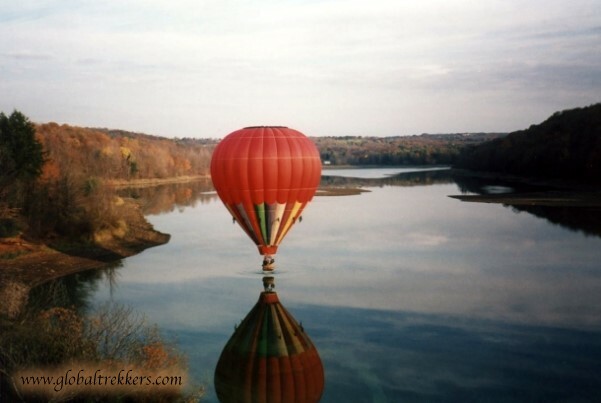 Richard brought his balloon down over the reservoir where they hovered only inches above the water before finally skimming across the surface, creating a hot air balloon sailboat! The reflection of the balloon over the water was breathtaking. During the flight the balloon is followed by the chase crew. Since it is never certain which way the wind will take a balloon, a chaser follows on the ground either by keeping the balloon in sight or using two-way radios. 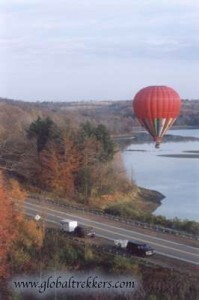 The chase crew remains in radio contact with the pilot, and the chase crew’s job is to be at the landing site when the balloon lands. This can be quite an adventure in itself since you never know where the flight is going to take you! After the balloon lands, the crew packs the balloon back into the chase vehicle and returns everyone to the launch site. One of the most important parts of being on a chase crew is dealing with the public. When the balloon is landing, the chase crew asks the landowner for permission to retrieve the balloon. Most landowners are not only happy to offer landing space, but often offer to assist in deflating and packing the balloon as well. Upon landing, the balloon crew will share a bottle of champagne with the landowners. This tradition goes back to the first days of ballooning over 220 years ago. Since there was no flight back then, people would see the balloons coming from the sky and think they were evil spirits or demons. The landowners, who were generally farmers, would attack the balloon with pitchforks. Balloonists started carrying champagne to dole out as they landed to pacify the people, and it’s been a tradition ever since. I made my way back to the Red Barn Village Bed & Breakfast still in awe. When I arrived, the innkeepers, Bert & Nancy Ayers, had prepared a scrumptious breakfast. I had forgotten that they had taken my breakfast order the night before, which was a great thing because I was hungry. As the other guests gathered in the breakfast sunroom which was tastefully decorated with antiques including old instruments, I couldn’t wait to share my experience. Hot air ballooning is definitely a must on life’s to do list. What better way to enjoy this occasion than to incorporate it into a relaxing weekend at a bed & breakfast in a beautiful country setting. Since the Red Barn Village is only a ten minute drive to the launch site at Lackawanna State Park, it was the perfect location. Bert and Nancy will pamper you with a hospitality that is unmatched. Be ready to be charmed, for the results are unique. Choose from three suites, each individually decorated with a private bath and kitchenette to make you feel right at home. If you actually need to get somewhere, a hot air balloon is a fairly impractical vehicle. You can’t really steer it, and it only travels as fast as the wind blows. But if you simply want to enjoy the experience of flying, there’s nothing quite like it. Many people describe flying in a hot air balloon as one of the most serene, enjoyable activities they’ve ever experienced. In short, you are hanging in mid-air with only a wicker basket beneath your feet, a thousand feet off the ground, unsure of where you’re headed and uncaring if you ever come down. Welcome to the world of hot air ballooning.